Large luxury new detached family villa, fully equipped inc WiFi. Landscape garden, large pool, BBQ area. Internally there is a very large lounge/dining room with fireplace, large 50" plasma TV, Free view, DVD and DVDs, PS2 and games, hi-fi, board games etc, which has 3 sets of doors leading to the garden and pool area. The property includes a fantastic fully equipped kitchen with table and chairs, utility room with washing machine etc. Door leading from the kitchen to the garden, BBQ and pool area. Beautiful pool with garden furniture, BBQ area, washing line. Pool table and table tennis in the hall !! Located 1.5km from Albufeira old town and beaches. Local restaurant within walking distance. Algarve shopping centre within 5 minutes drive. Golf course 10 mins drive. En suite bathroom - Jacuzzi bath, shower, wc, bidet & hand basin to bedroom 1. Shared bathroom - shower, wc & hand basin. En suite bathroom - shower, wc, bidet & hand basin to bedroom 3. En suite bathroom with bath, wc, bidet & hand basin to bedroom 4. 1 x 3 seater,1 x 2 seater,1 armchair,1 footstall all leather. Large 50" plasma TV, DVD player, PS2/games, Sky TV, Sony hi-fi, dining table, 8 leather chairs. Oak coffee table with matching TV unit and sideboard. 3 sets of double doors leading to garden. Hob, built-in oven, built-in microwave, dishwasher, 2 fridge/freezer's, juicer, toaster, espresso machine, sandwich maker, filter coffee machine, blender, ceiling fan, kettle. Glasses/place setting 12. Pots/pans galore. Utensils. Table/chairs. Nearest golf course is Salgados which is around 5 miles. All the courses in Villamora are approx 15mins drive away. Ideal family villa that has everything! Just returned from 10 night stay at this lovely villa. We were a party of 6 including 4 kids aged 15,13,11 and 7 years & they all loved it. Very spacious villa with ample room for 8 guests if needed & a perfect sized pool that has just been retiled to a high standard. The kids loved the pool and had the added bonus of a pool table & PS4 which really made it a home from home with good wifi. The villa had everything you required including towels, with plenty kitchen utensils & washing machine etc. Maids arrived midway through holiday & changed bed linen & towels. It's a perfect villa for a family holiday. I would say though that you may require transport as walk to Albuferia old town is a good 25mins & on some part of roads with no pathway whilst taxis can be difficult to get esp in evening time. Previous review also mentioned bakery in Industrial park very close by, this is handy for breakfast rolls & croissants etc. Can't fault the villa though as it was ideal for our needs & would highly recommend. A spacious villa with everything you need. Pool was great (recently retiled) and the villa was just as described clean and comfortable. The owner and management company were very helpful. Although the villa is close to Albuferia it’s not too close. The bakery / coffee shop in the wee industrial estate was great for breakfast croissants and bread in the morning. All main attractions are close by but having a car is probably essential to maximise exploring. Loved all the beaches, boat rides, Aqua parks and more!! Highly recommend. Lots of positives about this villa. Great location, near but not too near Albufeira. Good facilities on site with spacious rooms, BBQ and pool. Unfortunately, like a previous review mentioned, there were a few issues though. The pool has a number of tiles missing and two people(including one of the kids) cut their foot as a result. Some of the furniture is in a poor state of repair and we had avoid using it. Having stayed in numerous villas, I was really disappointed at the lack of welcome. There was nothing left for us on arrival. As a minimum I'd expect a manual with key information for the property but this was not present (we were told an agent would come over but they never arrived). This meant we never were able to make of all the promised features. Also, at every other villa we'd ever stayed at, there was some basic rations left (milk, bread , etc) but nothing here. Generally lots of individually minor maintenance issues were noted (splinters from pool table, broken sinks in ensuite, light bulbs needing replacement, TVs with no plugs, etc). There was also a poor standard of cleaning. Overall this is a lovely villa but needs a bit of TLC to make the best of it. The Pool is being retiled this winter which will eliminate the missing tiles which unfortunately are a consiquence of guest "picking" them off. The maid service is twice a week and other than this review the cleanliness has never been mentioned, other than to compliment . The garden furniture has all been replaced again after the damage received this season. - The swimming pool had missing tiles so there were various parts which were sharp and potentially could cut yourself on. The whole villa could do with a tidy up and a good paint. I would not rate this Villa as as five star it is more like a 2 star. Unfortunately it is impossible to please some people, I have no idea what these guests were expecting or indeed were they got the 5 star rating - the villa is exceptionally well kept and looked after with no expense spared in making it a real home from home. Please see all previous reviews. The villa was painted top to bottom inside and out this April so I am very surprised at this comment. The breakage deposit is returned once our agents confirm that there have been no issues, unfortunately there were many issues with these guests but we have returned the deposit in full and accepted that some people just treat your property with contempt - thankfully this is not the usual. The only broken items we are aware of are what these guests broke or abused, previous guests and later guests have had no issues at all. Fishermans beach at the old town is approx 5 minutes drive. Most beaches from Albufeira to gale are approx 5 minutes drive. In fact near enough everywhere is around a 5 minute drive from the villa. 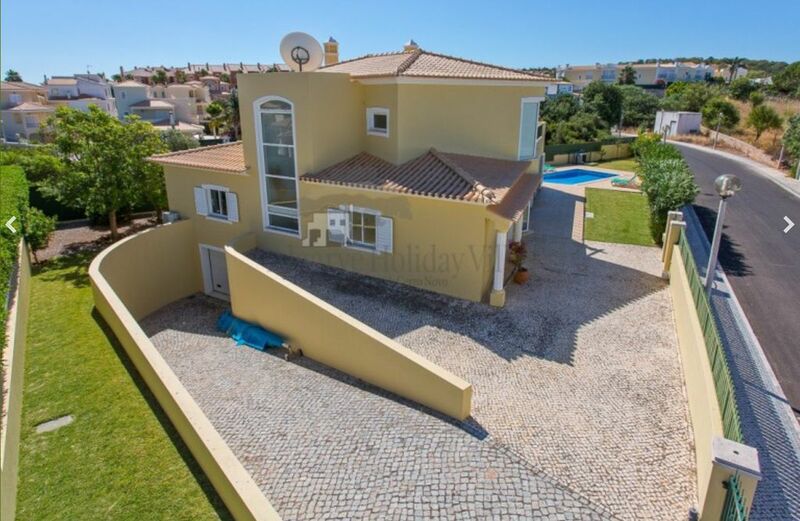 The nearest airport is Faro which is approx 35-40 minutes drive to the villa. A car is recommended but not essential as there is also a bus stop at the end of our road. Albufeira old town is approx 1 mile. Algarve shopping centre with designer outlet stores also large supermarket, cinema, bowling and large food court is approx 2 miles (5 minutes drive). Guia is the home of piri-piri chicken is also 5 minutes drive. Zoomarine fantastic to be able to swim with the dolphins, approx 15 minutes drive. Slide & Splash water park, approx 30 minutes drive. 1 local bar/snack bar within walking distance which the owner is fantastic and helpful in every way. There is also a bakery/pastilaria which also sells snacks, breakfasts, drinks etc. The nearest alisuper supermarket is at Pateo which is a 2 minute drive. The nearest bank would be Barclays at the marina or numerous banks within the old town. There is a new Tommie Tippee microwave/cold water steriliser. Car booster seats and two buggies free to use. Booking Notes: Deposit 30% with booking, balance due 6 weeks before date. Breakages deposit £250 refunded within 14 days of your return, once the manager has confirmed there are no breakages. Air-conditioning is £100 extra per week. Pool heating is £100 extra per week. Please ensure that cancellation insurance is taken out as will not be given, As per the terms and conditions. Changeover Day: These days can be flexible where they do not conflict with other bookings. On departure please vacate the villa before midday. Notes on prices: Prices are for the property per week in UK Pounds. Pool heating is an extra £100 per week. Air-conditioning is an extra £100 per week. The cot and highchair are at no additional cost. Discounts are available for longer lets. 2 pushchairs and 3 child booster seats are free for renters to use.